We all have TV shows that we like and keep up with on a weekly basis. 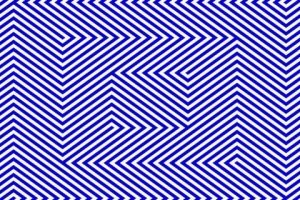 You are not going to have time to watch every interesting program though. In fact, keeping up with your favorite channels and programs could become a challenge for busy folks. 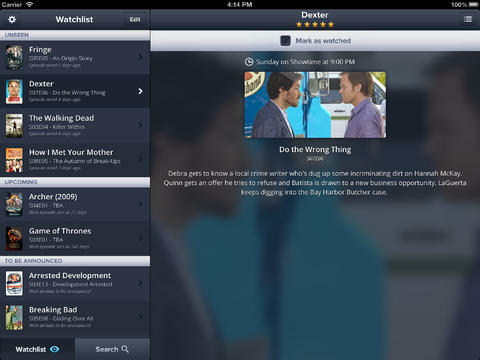 Episodes for iPad is a useful application that tracks your favorite TV shows and alerts you when your shows are airing. 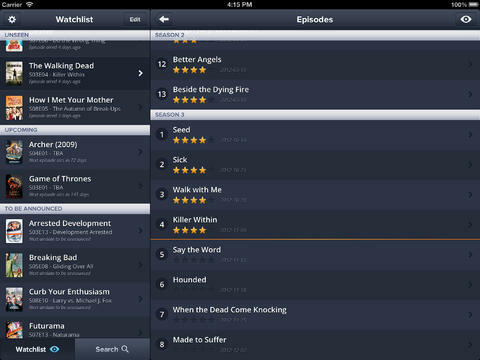 Episodes is a pretty simple tool that helps you track your favorite TV shows on your iPhone and iPad. It provides on air dates, episode listings, and summaries. You even get screen captures with the ability to see which episodes you have missed. Episodes provides push notifications that alert you when shows are due to air. Episodes is a handy tool to keep track of your favorite TV shows. 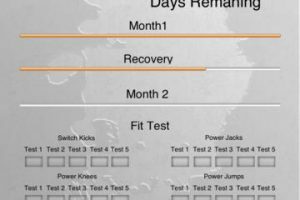 This universal application is available for free and offers a ton of useful info on the programs you are tracking. There is a lot to like about this app.